The treadmill is a versatile piece of equipment for individuals of all fitness levels. Many use it to lose weight by exercising, according to Cathy Roy, associate professor of exercise science at Virginia’s Longwood University. 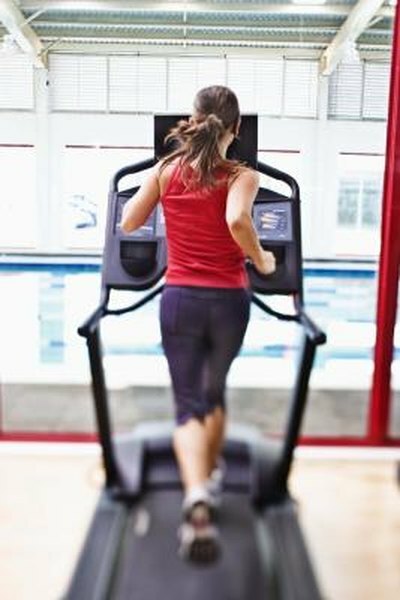 Treadmills offer the benefit of burning calories without a second thought to weather, traffic or a running route. An effective treadmill routine produces a cardiovascular workout that results in high calorie burn, giving your metabolism a boost for several hours. To optimize fat and weight loss, Roy says calories are the critical variable. Higher intensity exercise yields greater caloric expenditure, typically resulting in greater post-exercise fat burning. Roy recommends exercisers from novice to advanced mix in one to three days of high intensity interval training, with two or three days of steady cardiovascular walks or runs, crucial for recovery and prevention of injury. Aim to spend about 30 to 60 minutes on your treadmill every couple of days. Warm up at light intensity for five minutes. Walk or jog at a moderate pace for five minutes. Depending on your fitness level, increase to a fast walk or run for one minute, followed by a five-minute moderate pace; you should feel tired upon completion. Repeat the fast and moderate intervals three times. Finish with a five-minute, low-intensity cooldown. Do this the first four to five weeks, move to two-minute speed intervals for the next four to five weeks, and then move up to three-minute speed intervals. As fitness improves, adjust your pace. Faster speed results in more calories burned. Warm up at low intensity for five minutes. Walk or jog at a moderate pace for five minutes. Increase to an incline of 4 to 5 percent for five minutes, followed by a five-minute moderate pace on a flat grade. You should feel tired upon completion. As you raise the incline, you may need to slow speed to maintain good form. Repeat the flat/incline sequence intervals for the first four to five weeks, move up to 6 to 7 percent incline intervals for the next four to five weeks, then move up to 8 to 9 percent incline intervals. As fitness improves, adjust your pace. Faster speed and/or greater incline result in more calorie burn. Warm up at low intensity for five minutes. Walk or jog at a pace where you breathe harder but can talk without gasping. Depending on your initial fitness level, work up to a duration of 20 minutes, with a five-minute cooldown. Over the course of several months, the increase the duration to 50 minutes. If the pace after 50 minutes is no longer challenging, Roy advises adjusting your pace to align with the improvement in fitness. Warm up at low intensity for five minutes. Increase the speed or incline in chunks of 15 to 30 seconds, with equal recovery intervals, then work back down the ladder. Don’t forget to cool down. For example, following a warmup, run at 7 mph for 30 seconds, then increase speed to run for 30 seconds at 8 mph. Bring your treadmill back to 7 mph for 30 seconds, then increase to 8 mph for 45 seconds. Continue this low- and high-intensity pattern between 7 mph and 8 mph paces, increasing the duration of the intervals to 60 seconds and 90 seconds before scaling back down to intervals of 60 seconds, 45 seconds and 30 seconds before doing a cooldown. You could manipulate the same pyramid using incline instead of speed, or using a combination of increased speed and incline simultaneously. Roy advises a general rule of thumb to increase frequency, intensity and/or duration no more than 10 percent per week. A sample schedule could include speed intervals on Monday, steady state walk or run on Tuesday, a rest day on Wednesday, incline intervals on Thursday, a rest day on Friday, steady state walk or run or pyramids on Saturday, followed by a rest day on Sunday. Challenge yourself by completing a steady state walk or run on any of the prescribed rest days.